Phone-In dictation still proves to be the most economical, timely, and easy to manage telephone dictation system solution for many organizations. The digital revolution makes it easier and cheaper than ever to use a call recording system. 2/4 Line: $999.00 / $1395.00 Limited Time Sale! Simple setup process—ready in 15 minutes! Integrates with your network for file sharing and transcription pooling. Compiles author and file demographic information for easier indexing. Stores files on your hard drive. Includes all the equipment you will need to get started. Optional mode for automatic transcription with Dragon (Medical, Legal, Professional). A professional grade transcriber for your PC. 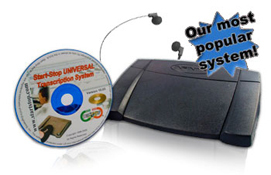 Transcribe Start-Stop Call-In Recorder files with foot pedal control and complete demographic information. 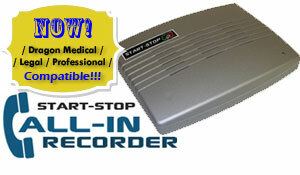 Compatible with Start-Stop Call-In Recorder files. Compatible with a wide range of digital file types. Queues, organizes, and archives dictation over the network. Organizes work sharing and networked transcription pool. 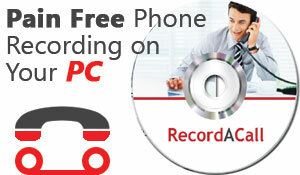 RecordACall is a digital recording program for Windows®. With it you can record, store, search and even send your recording using the simple user interface. Included a key-sized license USB dongle that gives you the freedom to use it on any PC with a free USB port. Record, store, search, and send your recordings.